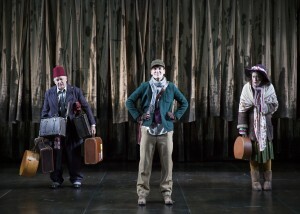 Shakespeare Theatre’s As You Like It opens with a conversation between Orlando de Boys, played by understudy Nathan Winkelstein, and his servant Adam, Jeff Brooks. This scene, which takes place on a noticeably bare stage, sets the tone for the rest of play. English director Michael Attenborough kept the play subdued and the set more so – the most elaborate prop piece that appears on stage is a picnic basket. It is part of a deliberate effort to keep the audience focused on the conversation and the Bard’s dialogue, a natural complement to the play’s extended scenes. Andrew Weems, Zoe Waites and Adina Verson. Photo by Scott Suchman. The actors did a grand job of articulating their words and speaking loudly and confidently but Zoë Waites stood out. Waites played Rosalind and has previously worked with Attenborough in England. When she gasped, I gasped and when she cried, I cried. The words slipped off her tongue easily and she was in control of the scene … Timothy D. Stickney plays the Duke Senior and his brother Duke Frederick, Rosalind’s father and his performance was stupendous. Often angry, Stickney was able to express his deep emotions through his speech and body language. He brought emotion to a scene dedicated for comic relief and his words left me on the edge of my seat. 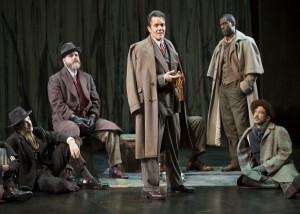 Derek Smith as Jaques (center) with Nathan Winkelstein, Todd Scofield, Timothy D. Stickney and Luis Alberto Gonzalez. Photo by Scott Suchman. Actress Zoë Waites, was undeniably gripping in her portrayal of Rosalind. With a strong, clear voice and tough demeanor, she managed to play all of Rosalind’s different emotional states: from happy to heartbroken to heartsick to determined, and finally to deeply in love … Luckily, she was not the only such actor. ­­­­­Andrew Weems, who played the clever court fool Touchstone, was funny and sarcastic. He loudly added in jokes and made fun of certain characters, and his romance with the somewhat senseless shepherdess, Audrey (played by Tara Giordano) was one of the funnier storylines in the play. Actor Derek Smith was also notably perfect in his role as Jaques, the melancholy companion of Duke Senior, spouting out some of Shakespeare’s most famous lines like “All the world’s a stage” and “A fool! A fool! I met a fool in the forest!” Even Nathan Winkelstein, who was filling in for Andrew Veenstra, was adorable in his portrayal of the main male character, Orlando, particularly when he was pretending to woo Rosalind through her alter ego Ganymede. Overall all, all of the actors filled their roles well and delivered their lines clearly and effectively. I would like to especially commend the actors Andrew Weems, Touchstone the loyal “fool” of Rosalind and Celia, and Derek Smith, Jaques a depressed middle aged man who seems fed up with the cards that life has dealt him. They played their roles exceptionally well and it was easy to tell that they were having fun with their roles. The performances by Touchstone, Andrew Weems, and Jacques, played by Derek Smith, were phenomenal throughout the production. Their abilities to convey the wit and humor in the story were outstanding and established them as the most entertaining characters in the performance. Zoe Waites, Adina Verson and Te’La Curtis Lee. Photo by Scott Suchman. The costumes are all made of earthy brown, green, and grey tones, almost as if to show the unity that the characters have to nature and their relationships to each other. 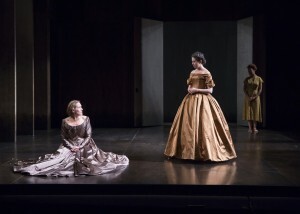 Rosalind’s first costume in the court of Duke Frederick’s is a classic hoop skirt ball gown, as is Celia’s. Celia’s gown is a woody burnt orange that blends with the rest of her court’s outfits, showing how at home she is, whereas Rosalind’s gown is platinum silver that sets her apart, showing how out of place she is. However, when Rosalind and Celia make their escape to the Forest of Arden and court of Duke Senior, the opposite becomes true. Rosalind’s costumes when she is disguised as Ganymede become earthy and natural in color, and Celia’s dress is overly colorful and out of place, with artificial and unnatural shades of green, reds, pinks, and overly frilled and formal hats. It is clear that Celia is out of her natural environment in this different kind of court. The lights, however, were the most impressive with small moments which enhanced both the reality and the more fantastic elements of the script alike. Robert Wierzel did not shortchange a single moment. From a lantern effect when Orlando is warned away from his brother’s house to the soft blue lighting of the added transitions that explored Rosalind’s deeper journey to the single backlight silhouetting actor Timothy D. Stickney’s transformations from the exiled duke to his brother to the hanging light bulbs in the very final scene, the design was as near to perfect as it could ever get. The utter care and detail were solely responsible for the creation of the most memorable and striking moments. All in all, this was a great introduction to Shakespeare on stage for me. It was a great story with a balance of humor, romance and adventure. I especially enjoyed the ending scene where the dancing started as a serious, slow one but quickly switched to a goofy one. This was entertaining for the audience, after the initial shock, as well as a good representation of the mood of the play. A lady dressed in gold with bare feet wanders on and off stage, opening doors and pulling curtains across. While at first this is confusing, as the play goes on one realizes that she appears every time that Rosalind is undergoing a transformation. She embodies Rosalind’s evolution, and really is at the heart of the play. The change between the forest and the court is shown mainly through changes in curtains and lighting, with the majority of the set staying the same. It works. You feel like you have entered a new place. The play concludes with a huge wedding it is a comedy after all. The lights came down and the lady in gold, who turns out to be Hymen the goddess of marriage, performs the wedding ceremony. It constitutes a grand conclusion to a great show. Every scene felt like it was being discovered for the first time, not just by the audience but by the actors as well. Even if you are not particularly comfortable with Shakespeare, this production will bring it home to you – a must see.